Katherine and Evart Both Receive the 1975 WMU Distinguished Alumni Award. Katherine Makes "Public Art" With Her Friend, Famed Architect Alden B. Dow. Katherine Speaks With Her Father, Samuel George Ardis, circa 1971. 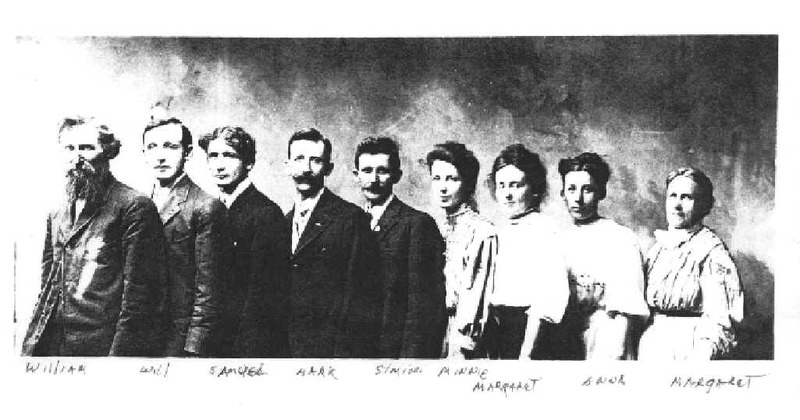 Katherine's Grandparents, Father, and Aunts and Uncles, circa 1898. 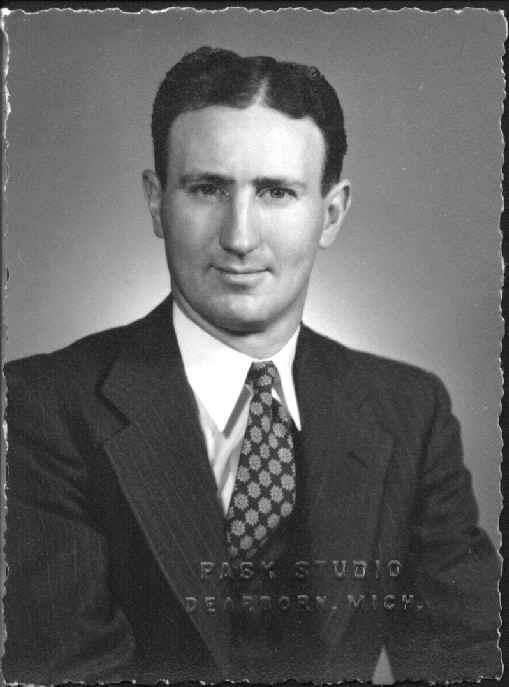 Katherine's Brother, Evart William Ardis, circa 1943. Jim & Pat Ardis Remember Katherine. NOTE: Katherine Ardis Ux passed away 1999 May 22 in Mt. Pleasant, Michigan USA. She was born 1909 August 22. At "almost 90" she was active with her students, her family, her friends... and her art... until a brief illness that took her from us. Friends and relatives of Katherine may send their remembrances of her for inclusion in this web site. We would especially appreciate photos of Katherine, or of her works of art, which can all be returned to you. Katherine Ardis Ux was my aunt... an older sister to my father, Evart William Ardis of Irvine, California USA. They grew up together in McBain, Michigan USA, in the 1910s and '20s. My dad will miss Katherine. They had a special affinity with each other since childhood. In recent times, separated by great distance, they wrote to each other several times each week. Katherine and Evart had both outlived their other siblings... Margaret, Burke, Doris, and Bernard Ardis. Katherine's father, Samuel George Ardis, owned a general store in McBain. Her mother, Katherine Burk, was from a Scots family in Mt. Pleasant, Michigan USA. It would be from her mother that Katherine Ardis would receive her introduction to, and love for, art. The senior Katherine was self-taught, but a sensitive artist and painter. The Ardis family was active in supporting school and church activities in their small farming community in rural Northern Michigan. The large Victorian house on Euclid Street was open to a steady stream of overnight visitors... preachers, politicians, lecturers, and artists... who made their way to this northern outpost in surprising numbers. Katherine's dad was born in Evart, Michigan USA, in the next county to the south of McBain... the town for which my father, her brother, Evart William Ardis was named. Katherine's grandfather, William Ardis, had been born in Armagh, Northern Ireland UK. William owned a livery in Evart. An adventurous sort of man, he had gone to Ireland and to England a number of times and returned with boatloads of horses to trade on the burgeoning American market. William had several brothers and sisters in America with him, including Robert Ardis, who farmed just outside of McBain. Other uncles and great-uncles to Katherine owned stores in several of the surrounding communities in Northern Michigan. Katherine also grew up with "Boyd cousins" in McBain... actually third-cousins, who were related from back in Armagh in Northern Ireland, UK. The people in McBain that weren't "Irish" were mostly Dutch Protestants... in fact, they were the majority. The Ardis family was of staunch Presbyterian stock... "Scotch-Irish", really... rather than Irish Catholic. Many Dutch people attended the Presbyterian Church in McBain. It later went out and was replaced by the Dutch Reformed Church, and the Ardis family became members. It seemed like an easy transition... all coming from good "Puritan" stock as they were... both the Presbyterians and the Reformed. Neither Katherine, nor her brother Evart, were really cut out for either small-town life or the merchant trade. Katherine became a teacher and attended Western Michigan University, in Kalamazoo, Michigan USA, to work toward a degree. Evart followed later and they both graduated with bachelor of science degrees from Western Michigan University in 1934. Evart Ardis wound up a school superintendent and later an administrator at The University of Michigan in Ann Arbor, Michigan USA. Katherine Ardis continued to teach... first as a public school teacher. She then obtained the position as Instructor at Alma College, where she established their first ever Department of Art. Katherine later completed graduate studies and secured the position as Professor of Art at Central Michigan University in Mt. Pleasant, Michigan USA. Hilton Ux was a "Dutchman"... with family ties to the communities of Eastern Pennsylvania USA. He and Katherine met in New York City. Hilton was working there for Westinghouse and Katherine was studying at Columbia University one summer. It was an "easy" match for both of them, and it led to a deep and lifelong love affair... and partnership. Katherine and Hilton settled in at Mt. Pleasant. Katherine had her teaching... and her art. Hilton became involved in the oil industry, which was developing its regional center for Michigan and the Midwest, in Mt. Pleasant. He specialized as a "landsman"... securing the necessary leases for the "wildcatters", prior to oil exploration and drilling. Hilton Ux worked as far away as Oklahoma and Texas. He never liked to be away from Katherine, however. As their careers progressed, and their investments grew, Hilton was able to turn down work in the "oil patches" of the Southwest. He continued to work around Michigan and the Midwest, developed a sideline selling the Helio Courier (one of the first STOL... slow takeoff and landing... aircraft) to oilmen, and generally adopted an approach to business that allowed him to maximize the time with his beloved Katherine. By the early 1950s Katherine was wanting to seriously expand her artistic horizons. As a professor she had her summers off and the ability to ask for longer sabbaticals, on occasion. Hilton, as an independent contractor in his oil work, was able to accompany Katherine at these times without jeopardizing his business. It was on this basis that most summers were spent either at Cranbrook Institute in Rochester, Michigan USA, or elsewhere... with Katherine studying, teaching, or perhaps doing a combination of the two. Katherine made two major sabbatical journeys into her art, each lasting a year or more. In June of 1955, my parents and I visited Katherine and Hilton on the luxury liner S.S. United States in New York Harbor. They were preparing for departure to Stockholm, Sweden. Katherine studied ceramics there for a year. Returning in July of 1956, they arrived in New York on the liner Stockholm. It was on the very next return voyage to Europe that Stockholm rammed and sank the Italian liner Andrea Doria, off Nantucket Island. A few years later Katherine went to Latin America, possibly for two (2) years. She and Hilton traveled by "tramp steamer", traversing the Panama Canal, and stopping at several places in South and Central America for Katherine to study. She worked with both trained and "primitive" artists among the native people. It was this trip that really shaped the future accomplishments of Katherine Ardis Ux in weaving, textile design, and the art of tapestry- making. This trip also cemented the partnership between Katherine and Hilton... one which would more and more focus on her career and her art. Always the devoted husband, Hilton Ux emerged as the artistic helper, personal promoter, and skilled business manager that would let Katherine concentrate on the things she loved... and avoid the "business details" that she often found distracting and tedious. Katherine had rejected the "merchant life" that had been led by her father, and so many of her uncles. Even in art, however, she found that everyone has to "sell something"... even if it is just themselves. Perhaps Katherine had known all along that she had married the right fellow to help "manage" a career. Perhaps it was just good luck. At any rate, Katherine began to concentrate on her "weaving". She designed beautiful fabrics... acquiring the finest of hand-built, hand operated looms... custom- built just for her. Hilton handled the negotiations, the finances... and the hauling of the "stuff" all around. He secured sources for the raw materials that she needed for her art. He negotiated contracts and sales, he developed the wonderful studio space in their home where she could work, and he made their travel plans. He also arranged for her art to be sent to the many displays and exhibits, which were becoming more and more in demand. All of this while Hilton was still keeping a hand in the oil business. Katherine was free to concentrated on her art, on her teaching... and on her learning. It was with this background that, at some point, Katherine must have decided to move beyond just "making cloth". Perhaps she was stung by the criticism that "weaving is not an art"... not like painting and sculpting, in the view of some. Katherine knew that weaving was, by definition, a "craft"... but, she also knew that it was "art"... that, in fact, it could be "high art". She began to explore more and more the world of "tapestry"... textiles not as clothing, rugs, or bedding... but textiles as "decoration"... as "displays"... as "exhibits"... as "art". I hope to soonbe able to show you more about the actual work of Katherine Ardis Ux. Let me just say for now that it is hard to imagine anyone that has done more to advance the art of textiles in 20th Century America. As with pioneers in any other field (say, Frank Lloyd Wright, in architecture) you must view her work in the context of the times in which she created it. Her bold colors, textures, and designs may seem "contemporary" today... even "comfortable", or "easy"... if still "striking". It wasn't "easy"... not when she did it... nor the way she did it. The world was not always ready for its lessons from this little 90-pound Irish girl from McBain, Michigan. Still, Katherine got her points across. And today we are all the beneficiaries of her talent... and her drive... to produce. Katherine wanted to do something "different"... and she leaves her body of work that shows what a clear vision she had. We also have a whole "army" of her students across the land... striving to make such wondrous things more "commonplace" for us all today. The art of Katherine Ardis Ux survives in a number of museums and private collections. We hope to eventually share with you some photographs of these works, as well as catalogs from her numerous exhibitions. Katherine Ardis Ux was honored with "one-man shows" at Cranbrook Institute in Rochester, Michigan USA, The Smithsonian Institution in Washington, DC USA, and other venues across the United States. One of the more interesting aspects of a very interesting career is Katherine's participation in "public" and "architectural" art. This came about through her lifelong friendship with architect Alden B. Dow. Mr. Dow was son of the founder of Dow Chemical Company in Midland, Michigan USA. A disciple of Frank Lloyd Wright, Mr. Dow was named Architect Laureate of his home state of Michigan, shortly before his death in 1983. As a result of this partnership many extraordinary works by Katherine Ardis Ux now adorn public and private buildings across Michigan and the rest of America. Rather than being mere displays of "public art"... these works have been made "integral" to Mr. Dow's designs for the buildings themselves. Thus, we have a rather unique sort of "joint statement" by two artists... each quite different in their outlook... but, with a deep and abiding respect for each other. The result is art in a public place... but, as an organic part of that space... and not as an afterthought, a distraction, or a cover-up. With her recent passing I have a sense that Katherine Ardis Ux had a life not just completed... but complete. Katherine would be happy and proud looking back on all of this. It wasn't always easy, but Katherine did what she wanted to do. Along the way she touched a lot of people and she left an amazing legacy of art. She honored "primitives" and "native peoples" with her study of their art, with her attitudes, and her teaching of their ideas and their techniques. Katherine Ardis Ux broadened the definition of "art" for all of us. She contributed significantly to the larger transformation of American culture since the 1950s. She taught us new ideas about color and texture. She forced us to re-evaluate our notions of "fineness" and of "quality". Finally, she helped us re-organize our notions of art... what it is... and what its place should be in our society and culture. Goodbye, Katherine. And thank you... for a life well-lived! 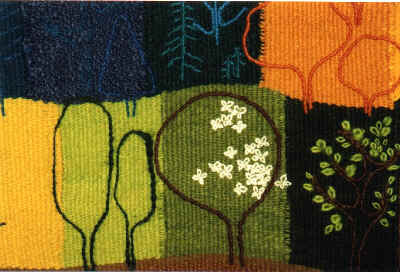 Tapestry by Katherine Ardis Ux 1909 - 1999. Katherine Ardis Ux was a "natural talent" in her art. She learned drawing and painting from her mother, Katherine Burk Ardis. Later she studied at Western Michigan University and Cranbrook Institute. She developed a love for pottery and of weaving. She spent a year studying pottery making in Sweden during the 1950s. It was during a year-long sojourn... traveling throughout South America and studying with the native people... that she became inspired to concentrate on her weaving. Katherine enjoyed a prolific career in weaving... advancing the craft of textile design and blending it with the art of tapestry. Katherine received considerable recognition for her work which has been critically judged as "highly innovative". She was honored with "one-man shows" at Cranbrook Institute, The Smithsonian Institution, and many other venues. Thoughout her career as an artist Katherine shared her love of art with young people by maintaining a position as Professor of Art at Central Michigan University in Mt. Pleasant, Michigan USA. Link to additional information-- coming soon.